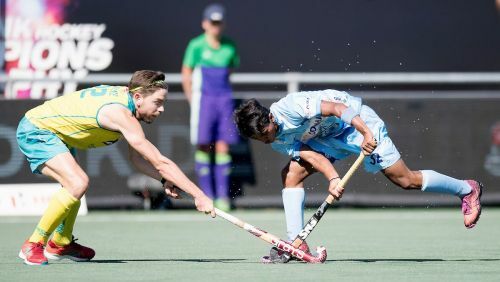 Buenos Aires (Argentina), 09 October 2018: A dominant performance from the Indian U-18 Men’s Hockey team saw them register an emphatic 9-1 victory over Austria in their second Hockey 5s Pool B match of the Buenos Aires 2018 Youth Olympic Games held here at the Parque Polideportivo Roca on Monday. The Indian Men's team continued their winning start to the campaign as Sudeep Chirmako (6', 11', 14', 18') and Shivam Anand (4', 10', 17') scored hat-tricks while Sanjay (2') and Captain Vivek Sagar Prasad (13'') also scored in the victory. Austria's only goal was scored by Paul Drusany in the 8th minute of the match. There was no shortage of confidence within the Indian team as they started to attack their opponents in the first minute itself. Sanjay, Sudeep Chirmako and skipper Vivek Sagar Prasad, all took shots in the first two minutes but could not score until Sanjay scored off his second shot to give India the lead in the 2nd minute. It was Shivam Anand who doubled India's lead in the 4th minute as Austria failed to create opportunities. Two minutes later, Sudeep Chirmako also scored to make it 3-0 in India's favour but Paul Drusany pulled a goal back for Austria in the 8th minute. With just seconds remaining for the half-time whistle, it was Shivam Anand who restored India's 3-goal advantage as he scored his second of the match. Austria started the second period on the offensive as they forced Indian Goalkeeper Pawan to make three saves inside the first minute but it was India who scored again as Sudeep Chirmako pounced on a counter to make the scores 5-1 in India's favour. The Indian team's continued dominance saw them score four more goals in the second period which came through Sudeep Chirmako (14', 18' ), Captain Vivek Sagar Prasad (13') and Shivam Anand (17') as the team registered their second consecutive win to stay at the top of Pool B.
India will now face Kenya in their third match of the Hockey 5s competition on Tuesday, 9th October 2018, at 1800 hours IST.